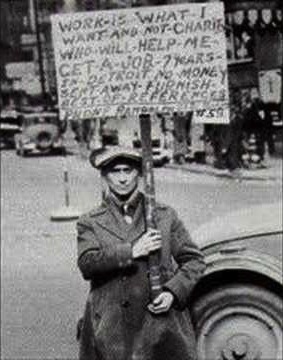 Brother, Can You Spare Me A Job? Screenshot from “Brother, Can You Spare a Dime” video/song (song originally recorded in 1932), July 26, 2014. (http://youtube.com). In the past five months, there’s been much debate and derision over the White House’s My Brother’s Keeper Task Force and Initiative. Most of it has centered around the exclusion of girls and young women of color from the initiative, as if the problems affecting Black and Latino males aren’t the same ones affecting Black and Latino females. Poverty, a resource-poor education, lack of entry-level jobs leading to careers, woeful access to higher education, lack of access to public services. These effects may lead to different responses from boys/young men of color and girls/young women of color, but the problems that effect vulnerable populations of color are no respecter of gender. There’s other problems with the initiative, even if President Barack Obama and the White House were to ensure the inclusion of Black and Latino females in the My Brother’s Keeper Initiative tomorrow. It’s an extremely racially paternalistic initiative. On the face of things, it’s not much different from the work Booker T. Washington did a century ago via the William McKinley and Teddy Roosevelt administrations and with money from White philanthropists such as Henry Huttleston Rogers (Standard Oil), Julius Rosenwald (Sears), and George Eastman (Kodak). Sure, in the case of Washington, The Rosenwald Fund built a few thousand schools, and the philanthropists contributed money to Washington that would build an endowment for Tuskegee. Still, that money came with strings attached. Most of the schools built weren’t high schools, were geared toward what we would call low-level vocational education today, and certainly weren’t part of any agenda to end Jim Crow. For all the good Washington was able to do through these robber-baron era philanthropists — especially in reducing Black illiteracy — it took Black migration out of the South to lead to lasting changes around notions of racial progress and the idea of segregation as the norm for a representative democracy. 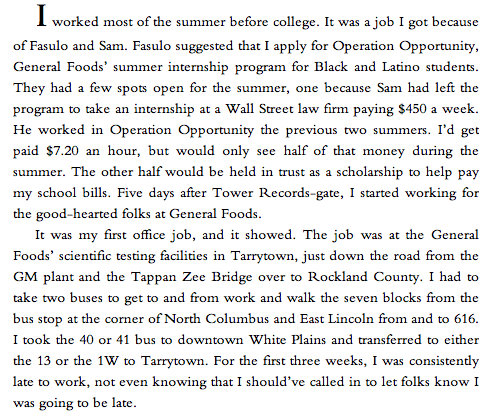 As for My Brother’s Keeper, I am reminded of a passage from my Boy @ The Window about my very first full-time “office” job in the summer of ’87, in between my graduation from Mount Vernon High School and my freshman year at the University of Pittsburgh. It’s about my working for General Foods (now Kraft Foods) in Tarrytown, New York as part of their Operation Opportunity program. 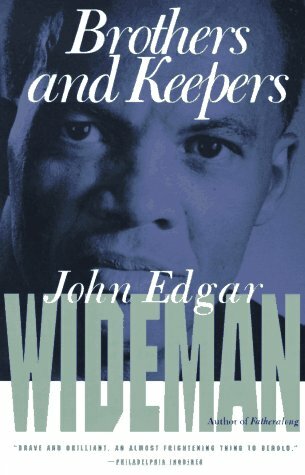 John Edgar Wideman, Brothers and Keepers (originally published in 1984), July 26, 2014. (http://goodreads.com). Beyond the $1,022 the program saved on my behalf — which would go toward room, board and two textbooks for my second semester at Pitt — there really wasn’t much about this program that was opportunity-inducing. Operation Opportunity seemed like it was a checkmark that General Foods could put in its “doing good” column. It provided an opportunity to observe others and do menial tasks without actually promising anything that would help me even a year later, as I went through the summer of ’88 unemployed, and the first week of my sophomore year at Pitt homeless. Not to mention, I picked up a terrible cold in the heat of a 98-degree-July day while spending two hours in a meat-locker-of-a-trailer doing measurements on Jell-O pudding pops! Now I have no idea what the Annie E. Casey Foundation, the W.K. Kellogg Foundation or Magic Johnson Enterprises intends to do to be keepers of brothers, or brothas, for that matter. But all too frequently, these efforts turn into one-time experiments or corporate-responsibly checkmarks. As my friend and colleague Catherine Lugg has said more than once over the years (albeit, on education research, not specifically on this), social change and diversity efforts are far more than just “bringing a pet to class.” The idea that we need to learn how to work hard is yet another myth that this initiative will perpetuate, whether it’s a success or a failure. It’s not hard to figure that poor children and young adults of color need more access to public health services, more resources in their formal education, more and better quality food to eat, and more nurturing. Whether any of these kids or young adults — male or female — can obtain these resources without racial paternalism, experimentation or other strings attached, I for one remain extremely skeptical.